“Don’t thank me. If you want to thank someone, thank his highness the king.” With that, Duke Deathcrier waved his hand, causing everything within 30 meters to suddenly blur and ripple, as if it were separating from the area around it. Bai Xiaochun’s heart trembled as he looked around at what was happening. Soon, it became clear that what was actually happening was some sort of major teleportation.... It was almost as if the entire area were simply being plucked up and moved somewhere else. Rumbling sounds filled his ears, and then everything vanished. When he and Duke Deathcrier reappeared... they were in front of a spectacularly immense city! It was currently afternoon, and brilliant sunlight shone down on the enormous city, making it seem particularly impressive. It looked like some primeval beast, baring its fangs at all creation! And that was just the sense Bai Xiaochun got without even looking closely at it. Even more shocking was that Giant Ghost City itself existed in the middle of a massive, bottomless pit. The pit was so wide that not even divine sense could span it from one side to the other. 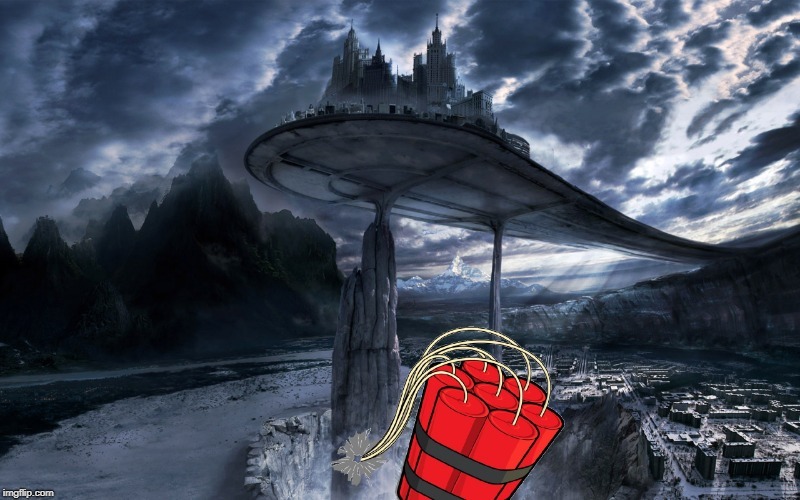 Giant Ghost City itself existed on a huge column that rose up from within the bottomless pit! Far down in the pit was a hazy mist filled with endless vicious faces and heads, a horde of ghostly souls which screamed constantly. To get from the cliffs that were the border of the pit to the city itself, one had to cross any one of a number of violet chains, each one of which as thick as a person was tall. They hung like suspension bridges over the misty depths of the pit. Bai Xiaochun could see people off in the distance, flying toward the city in beams of light. However, they didn’t dare to fly over the pit and into the city, but instead dropped to the ground and then walked along the huge chains. Going or coming, that was the only way to get into the city. As Bai Xiaochun continued to examine the area, he realized to his shock that in the middle of the city... was an enormous, shocking statue! It was a giant ghost with two horns on its head and green skin, tens upon tens of thousands of meters high. It was so high that it seemed to be holding up the sky! Furthermore, on its head was a royal palace! The palace itself was difficult to make out, and although it was impossible to tell who resided there, it didn’t take much guesswork on Bai Xiaochun’s part to come up with an idea. “That must be where Giant Ghost King lives....” Even just looking at the royal palace, Bai Xiaochun could sense a pressure like that of all heaven and earth weighing down on him. It left him with the sensation that whoever was in that royal palace was not a person, but rather, some sort of god! Another shocking thing he noticed was the giant statue held a palace in each of its hands. Furthermore, both palaces had huge stone steles in front of them, with the name of the palace inscribed for anyone to see. In the left hand was Deathcrier Palace, and in the right hand was the Netherworld Palace! Bai Xiaochun was shaken by the mere sight, and was immediately certain that those palaces belonged to devas. And considering that the left-hand palace was named Deathcrier... he was eighty to ninety percent sure that it belonged to the black-robed old man standing next to him. Bai Xiaochun was not as ignorant about Giant Ghost City as he had been when he first arrived in the Wildlands. During his days in the Bai Clan, he had done quite a bit of digging around for information, and now knew a little bit about the place. For example, he knew that Giant Ghost City consisted of an inner and outer city. The inner city was strictly controlled, and only people with high status could enter it. Most of the people who lived there were nobility, ministers, and other people with close connections to the royal house. The outer city was where the common people lived, and was a much livelier place. There was a moat that separated the inner and outer cities, the water of which contained demigod-level restrictive spells. Without the proper command medallion, anyone who tried to cross that moat would be melted into nothing but bones. Bai Xiaochun’s heart was already pounding as he wondered why he had been brought to Giant Ghost City. Although he was very nervous, he put on the most charming expression possible as he stood there behind Duke Deathcrier. He had already decided that, no matter why the Giant Ghost King had summoned him, it was a good thing to be in Giant Ghost City. After all, the teleportation portal he needed to access to get back home was located in this very city. Duke Deathcrier’s face was completely expressionless as he led the way, and he didn't say a single word. Furthermore, they didn’t enter the city via the chains, but rather, by flying directly into the city. As soon as they appeared in the city, the soul cultivator guards on duty looked over with reverent expressions and bowed respectfully. In addition to bowing in greeting, everyone surreptitiously sized up Bai Xiaochun, which he noticed. As he proceeded along, he decided that since the Giant Ghost King had summoned him, he should be on his best behavior. Perhaps, if Duke Deathcrier put in a good word for him, he could get a high position in the city. That way, the Bai Clan definitely wouldn’t be able to touch him. With such thoughts on his mind, he followed Duke Deathcrier through the city. Duke Deathcrier led him directly toward the inner city, and within the space of a few breaths of time, they were standing in front of the moat that separated the two cities. The water was black, and looked incredibly dangerous. In fact, Bai Xiaochun even took a few steps back when he saw it. Then he looked over at Duke Deathcrier, wondering why they had stopped moving. “Uh, Senior... aren’t we supposed to be going over there...?” Blinking, he looked meaningfully toward the giant ghost statue. His voice didn't seem to echo out very far. However, in response, the waters of the moat rippled, and then a whirlpool appeared, out of which stepped three middle-aged men. Bai Xiaochun could already sense that something was off about the situation. Why wasn’t he being taken to see the Giant Ghost King? Of the three newcomers, the man in the lead position wore a green robe, and was clearly half a step into the Deva Realm. As for the other two, they seemed a bit weaker, and were obviously the man’s subordinates. The green-robed man immediately flew over to stand in front of Duke Deathcrier, where he clasped hands and bowed deeply. Li Xu and his two subordinates immediately voiced their assent. Without another word, Duke Deathcrier turned and flew toward the giant ghost statue. His mission from the king had been to bring Bai Hao back and then give him a job in the city. As for what exact position to give him, the Giant Ghost King naturally didn’t care. Therefore, Duke Deathcrier didn’t put much thought into the matter, and simply handed him over to the city’s famous Devil Penitentiary.